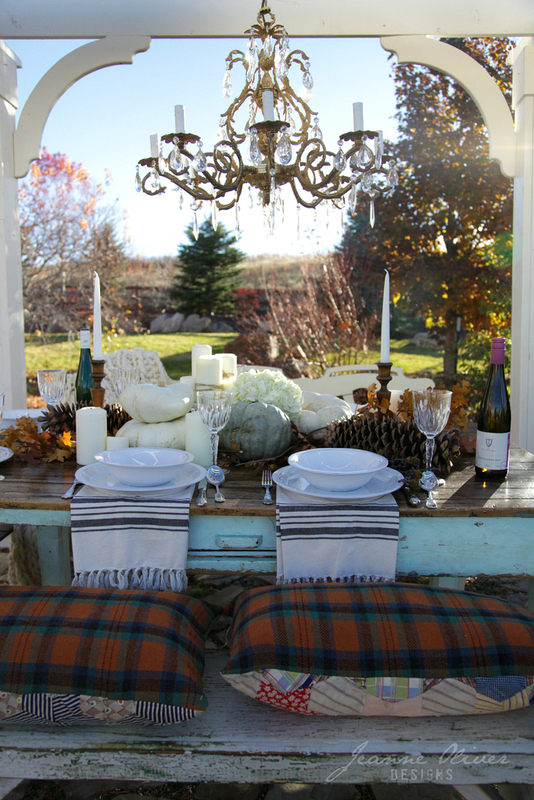 What is not to love about a holiday all about family, friends, good food and just being together!? 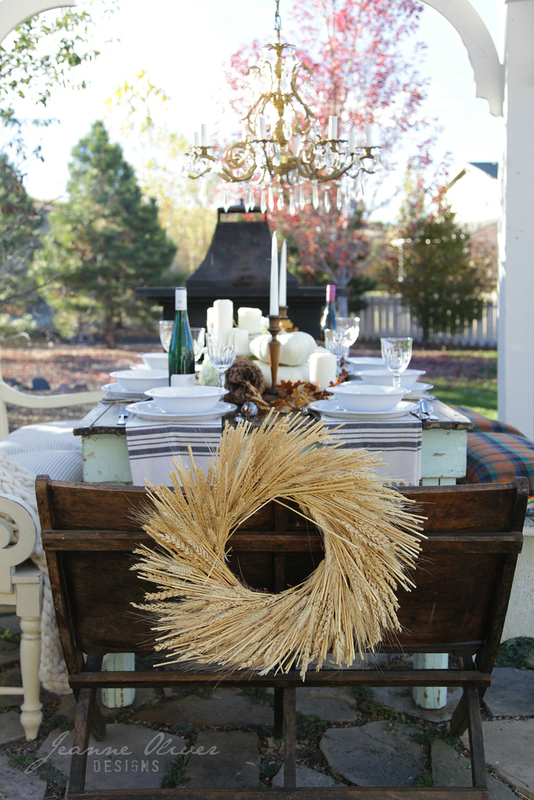 If you live where it is warm enough to still entertain outside I highly recommend it this Thanksgiving. 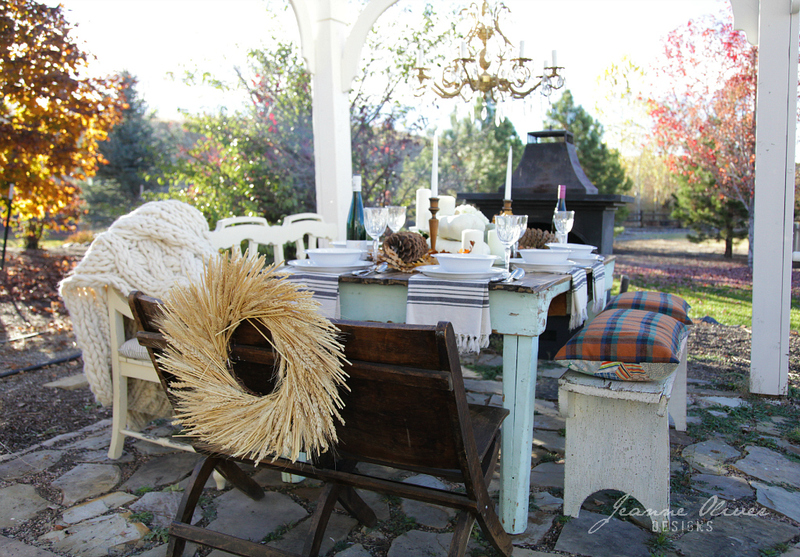 Being outside is unexpected for dinner parties and it really brings new energy into your gatherings. 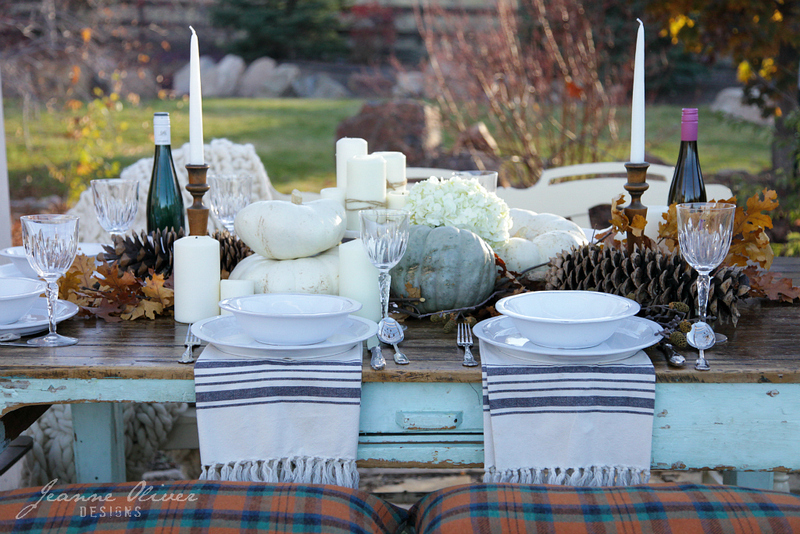 I wanted to share how to bring our own fall tablescape together by using as an example of a tablescape I designed in our last home. 1. 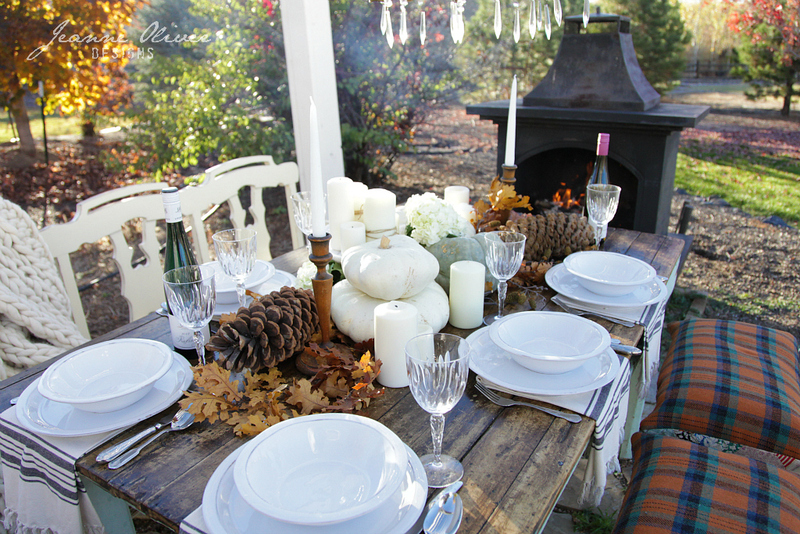 Before I put the table together I thought about how could I make our table a little different this time, make use of our space (yard), incorporate colors of the season and use decor I already owned. 3. 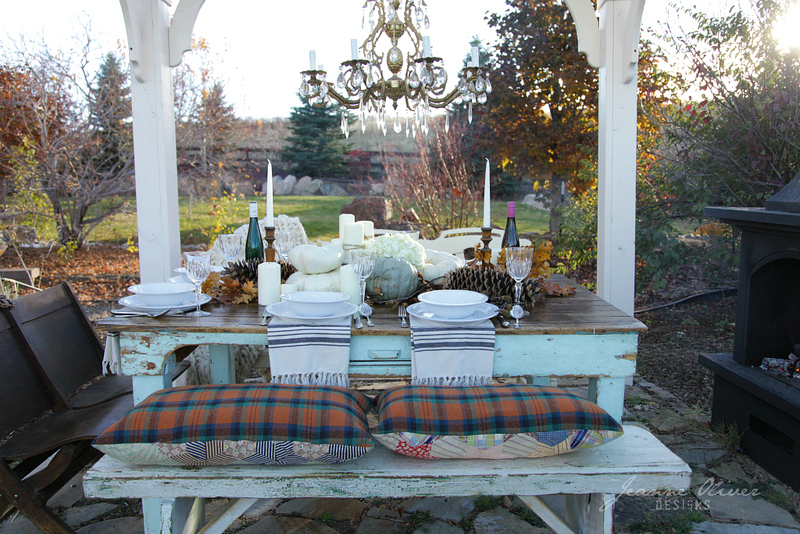 Bring out blankets, wool pillows, napkins (they were really hand towels) for color and texture. 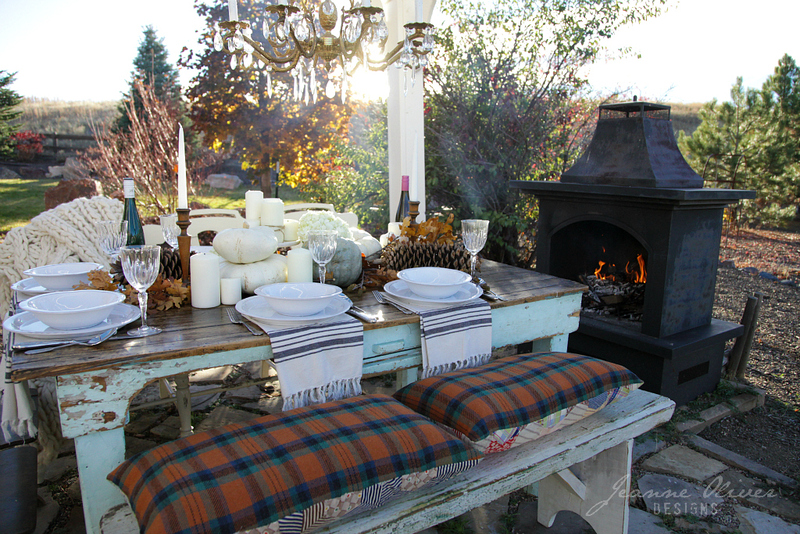 I love creating layers in decorating (as with clothing) so this step is important to me to creating a warm and cozy table. 4. Bring out the dishes and glassware. 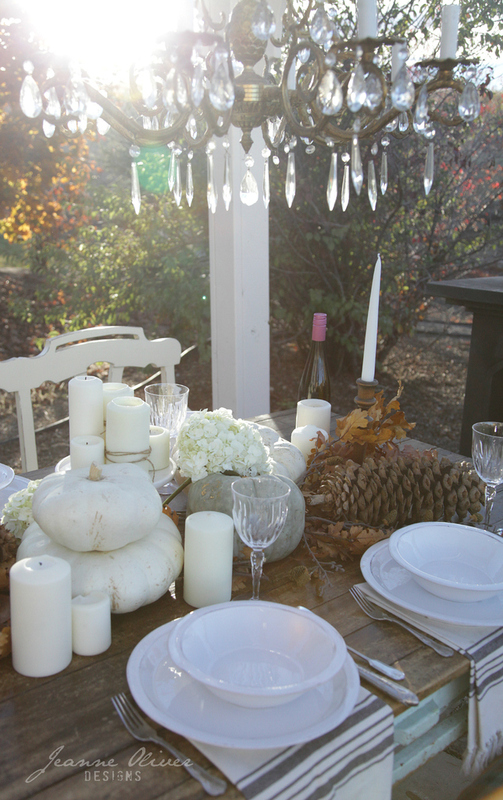 For this table I am just using our everyday white dishes but mixing them with our nice crystal. Mix and match your pieces and have fun with them. They are there to be used. 5. Add height to your table. 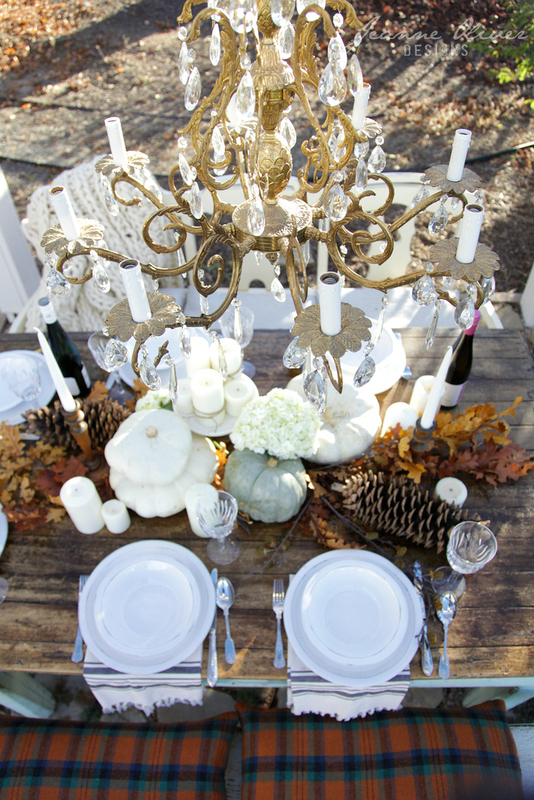 I did this by adding the wooden candlesticks with white tapers, stacking pumpkins, putting the wine on the table, adding a wood and marble pedestal and adding simple candles on top with twine for texture. 6. Now, fill it in with all of the special touches of the season. 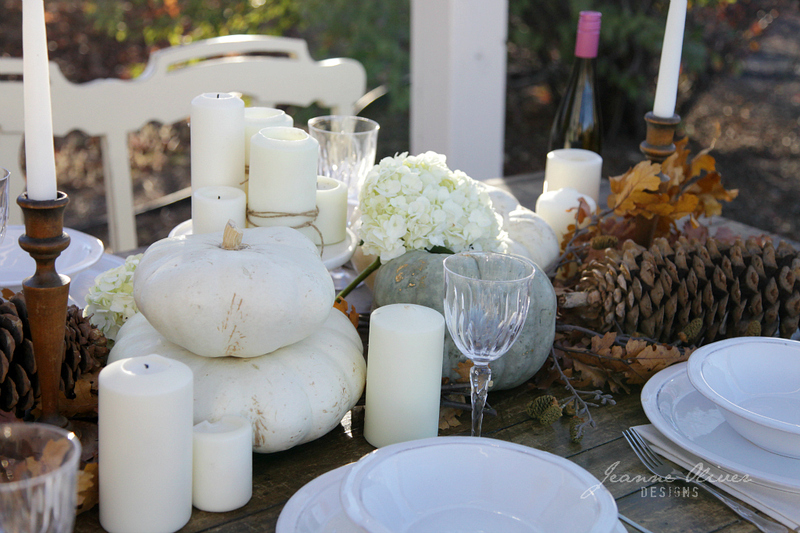 I filled it with white hydrangeas to keep it neutral (this is very typical for me with flowers), large pinecones, leaves, branches and acorns. 7. Add sparkle. For us this was having the crystal wine glasses, silverware and especially hanging the vintage chandelier (it was not wired in and was there just for looks). 8. 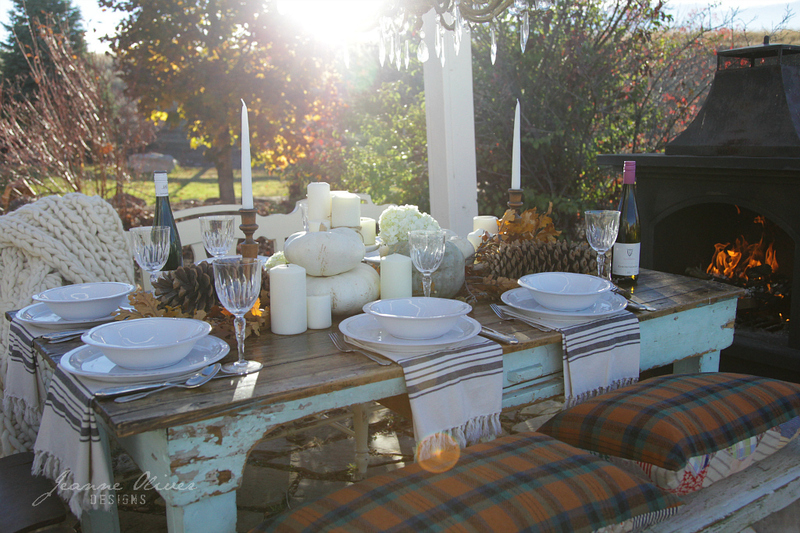 Light the fireplace, light the candles, turn the music on and crack a bottle of wine and you are ready to begin. 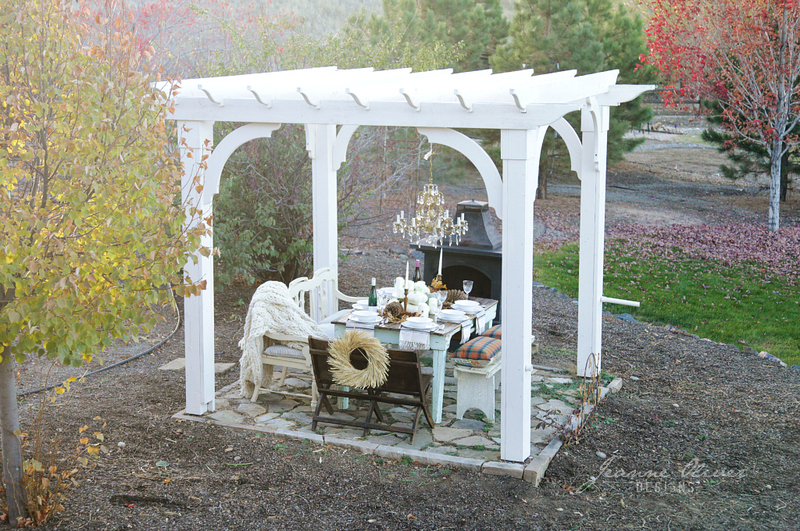 The more you do this the more you will get comfortable just shopping your own home and making little changes to your tablescape for the seasons. 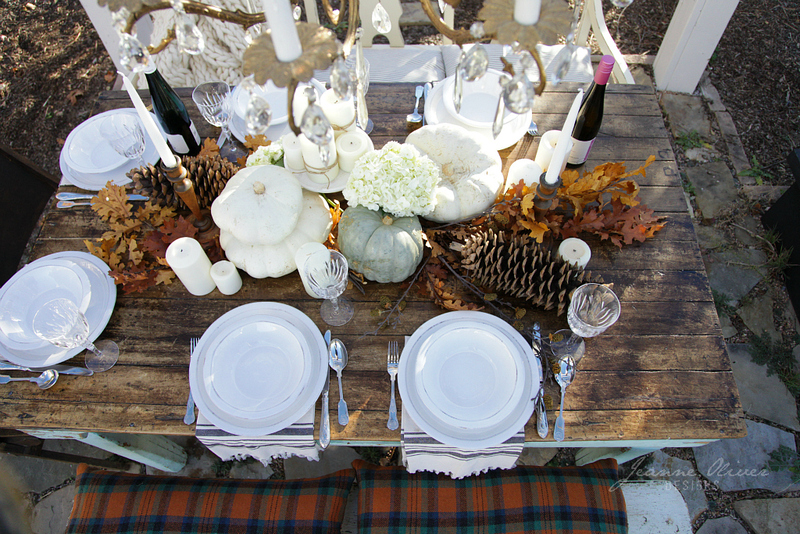 You will have a go-to layout and just change out the dishes or flowers or seasonal filler. 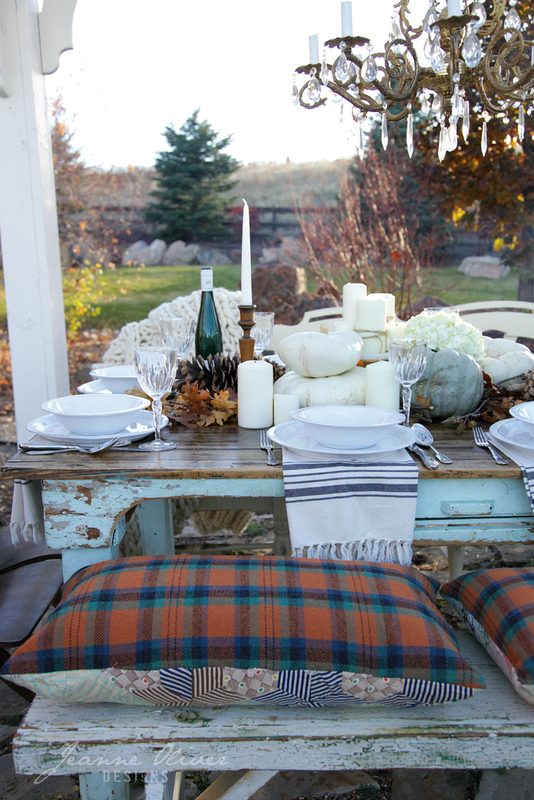 Most importantly…You will never regret making your holiday about the people that join you around that table. AND When you have fun so will the people that you love around that table. That’s very pretty. I set a table last weekend, (two blog posts ago), because a friend gifted some of her mother’s vintage doilies to my daughter for her antique wedding rental business. When my daughter came for a visit we invited some friends for supper and it was brilliant fun using some of my collections and setting the table. Small special events/things really do make a house a home. I love the idea of shopping my own home too.